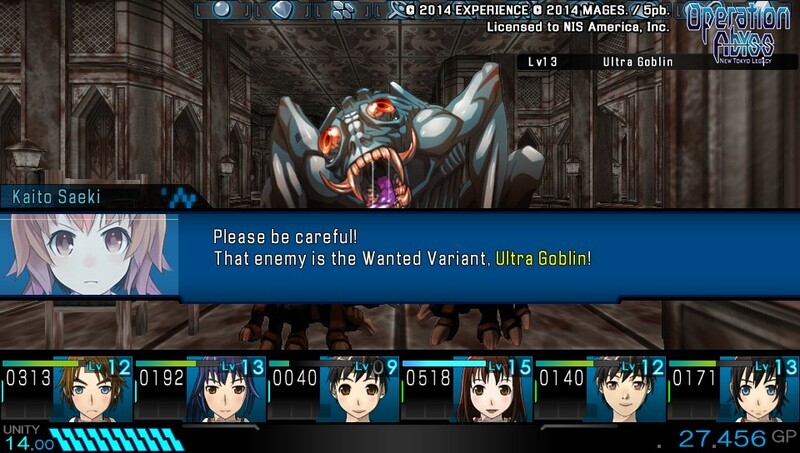 NIS’s latest Vita release is Operation Abyss: New Tokyo Legacy. That’s quite a mouthful, but so is the game genre it falls under. Here’s our review. Operation Abyss: New Tokyo Legacy classifies as a “sci-fi dungeon crawler RPG”, thus easily making it the first of its kind that we do a review for. However – while a very specific subgenre, there are plenty of familiar features to be found. Dungeon crawling is something made famous by Dungeon Master on the Atari ST in the late eighties, and recently saw a bit of a revival with the excellent Legend of Grimrock games. What Operation Abyss does differently, aside from the sci-fi theme, is that the basic gameplay involves more than just dungeon crawling – something best done while drawing maps on a piece of paper as you try to get through said dungeon. In Operation Abyss, you take control of a team of six youngsters called the Xth Squad – on a mission to discover the secrets behind several mysterious portals that have opened up (and lead to a dimension called…. the Abyss). On your quest, you will have to traverse a multitude of labyrinths and will face off with a variety of enemies called the Variants. Combat takes place in the form of a turn-based battle very similar to that seen in many JRPG games, with several small twists that make things interesting, such as cooperative attacks using several members of your team at once. As the term “sci-fi dungeon crawler RPG” indicates, Operation Abyss: New Tokyo Legacy tries to be a lot of things at once. That’s ambitious and commendable, but also its main flaw. The game features a lot of familiar aspects from various game genres, but doesn’t excel at or innovate any of them. For those who are not die-hard fans of the aforementioned genres, the multitude of stats and menus can also discourage them from playing. However, if you’re interested in dungeon crawlers or JRPGs, then NIS’s latest Vita game is a competent and well done adventure. It won’t blow you away, but offers a lengthy challenge for those who appreciate games of this type – presented within an interesting sci-fi setting.